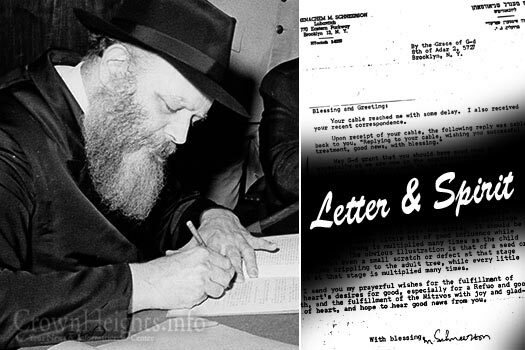 In light of the current situation in the Holy Land, we present a letter from the Lubavitcher Rebbe about Pikuach Nefesh (an issue of Life & Death) regarding giving away Israel's land to the Arab enemy. This letter is unusual. It was written in English and It was made available by Rabbi Sholom Ber Shapiro in volume 3 of the Rebbe's letters in English: "The Letter and The Spirit", put together by the daughter of Rabbi Nissin Mindel, Mrs. Frieda Shapiro. During these challenging times – with so much upheaval and confusion, our brethren in Eretz Yisrael are being viciously attacked by a cruel enemy –. The Rebbe’s guidance give us direction and clarity. What was relevant when this letter was written in 1981, regarding the political zeal to give land for a false peace hasn't changed. Today, there is more land being given, more deaths and continued talks to give even more. Just as the problem has not changed, nor has the way out. The Rebbe's solution is just as relevant today –. For the words of tzadikim are eternal. They sit and wait for us to fulfill them. And when we do, G-d opens his bountiful hands and salvation pours forth. This is presented by CrownHeights.info and Nissan Mindel Publications. A unique letter of the Rebbe that was written originally in the English language, as dictated by the Rebbe to his secretary Rabbi Mindel. This is to acknowledge receipt of your letter and enclosure. I am reluctant, on principle, to involve a layman, however knowledgeable, even if he possesses s’michah, in a matter that is the subject of debate between rabbis. However, after you received a detailed letter from a rabbi and request a clarification, I have no choice but to address myself to the issues at hand in reply, though necessarily not in depth. I must begin with a general but crucial point, namely, that the arguments against my supposed stand are based on misinformation or on misconception of what my stand is. Indeed, I find it difficult to understand how this could have happened, since I have repeatedly explained my position. So I will recap it once again. I am completely and unequivocally opposed to the surrender of any of the liberated areas currently under negotiation, such as Yehuda and Shomron, the Golan Heights, etc. for the simple reason and only reason, that surrendering any part of them would contravene a clear psak din in Shulchan Aruch (Orach Chayim, sec. 329, par. 6,7). I have repeatedly emphasized that this psak din has nothing to do with the sanctity of Eretz Yisroel or with “days of Moshiach”, the ge’ula and similar considerations but solely with the rule of piku’ach nefesh. This is further emphasized by the fact that this psak din has its source in the Talmud (Eiruvin 45a), where the Gemora cites as an illustration of a “border town” under the terms of this psak din – the city of Neharde’a in Babylon (present day Iraq) – clearly not in Eretz Yisroel. I have emphasized time and time again that it is a question of, and should be judged purely on the basis of, pikuach nefesh, not geography. Should there be a question whether the risk does in fact create a situation of pikuach nefesh, then, as in the case of illness, where a medical authority is consulted, the authority to make a judgment is vested in the military experts. If military experts decide that there is a danger of pikuach nefesh, there could be no other overriding considerations, since pikuach nefesh overrides everything else. Should the military experts declare that while there is such a risk, yet it should be taken for some other reason, such as political considerations (good will of the gentiles) – this would clearly be contrary to the psak din, for the psak din requires that pikuach nefesh, not political expediency, should be the decisive factor. Now in regard to the liberated areas, all military experts, Jewish and non-Jewish, agree that in the present situation giving up any part of them would create serious security dangers. No one says that giving up any part of them would enhance the defensibility of the borders. But some military experts are prepared to take a chance in order not to antagonize Washington and/or to improve the “international image,” etc. To follow this line would not only go against the clear psak din, but would also ignore costly lessons of the past. One glaring case in point is “the Yom Kippur War.” Days and hours before the attack, there were urgent sessions of the government discussing the situation with the military. Military intelligence pointed to unmistakable evidence that an Egyptian attack is imminent and the military experts advised a preemptive strike that would save many lives and prevent an invasion. However, the politicians, with the acquiescence of some military experts, rejected this action on the ground that such a step, or even a general mobilization, before the Egyptians actually crossed the border, would mean being branded as the aggressor and would jeopardize relations with the USA. This decision was contrary to the said psak din of the Shulchan Aruch, as pointed out above. The tragic results of that decision bore out the validity of the Shulchan Aruch’s position (as if it is necessary), for many lives were needlessly sacrificed and the situation came close to total disaster, but for G-d’s mercies. Suffice it to mention that the then Prime Minister later admitted that all her life she would be haunted by that tragic decision. I know, of course, that there are Rabbis who are of the opinion that in the present situation, as they see it, it would be permissible from the viewpoint of the Shulchan Aruch to return areas from Eretz Yisroel. But it is also known on what information they based this view. One argument is that the present situation is not identical with the hypothetical case of Neharde’a cited in the Talmud, because Eretz Yisroel is not in the state of “being besieged by gentiles.” A second argument is that the present surrendering some areas would not endanger lives. That these arguments are based on misinformation is patently clear. The Arab neighbors are prepared militarily; what is more, they do demand these areas as theirs to keep and openly declare that if not surrendered voluntarily, they will take them by force and eventually everything else. A Rabbi who says that the said psak din of the Shulchan Aruch does not apply in the present situation, is completely misinformed on what the situation actually is. A further example of how facts can be publicly distorted is in connection with the surrender of the oil wells in Sinai. Some warned at the time that it would be a terrible mistake to give them up, since oil, in this day and age, is an indispensable vital weapon, for without it planes and tanks are put out of action as surely as if they had been knocked out. Nevertheless, there were Rabbis who defended the surrender of the oil wells – again having received and accepted the “information” that the country has ample oil reserves that would last for months. When it was suggested to them to verify this information with anyone who has some idea about the physical limitations of storing oil to build up reserves, especially in a small country with limited storage space – the suggestion was ignored. Sure enough, before long the government found it necessary to demand from the USA urgent oil deliveries, because the reserves would last only a few Moreover, prominent members of the government publicly admitted that it was a serious mistake to have surrendered the oil wells. But it also noted that since the surrender of the oil wells in Sinai – according to the government’s figures – some two and a half billion dollars was paid by it to Egypt for oil from the very same wells that had been surrendered. Not to mention the fact of having to buy oil also in the spot market, all at exorbitant prices. Parenthetically, it is known who supplied the Rabbis with this “information.” When one of the Rabbis was asked, after it had become all too obvious that their psak din was based on false information, why he does not come out and openly reverse his position, the answer was that if he admitted publicly that he had been misled by a prominent Jew, with beard and pe’os, who is active in Jewish affairs, it would create a chilul Hashem. Queried further whether this consideration halachically overrides correcting a psak din affecting the pikuach nesfesh of many Jews, there was no further response. I was taken to task (and this also in full public view) for placing so much emphasis on the security of Eretz Yisroel , the argument being that what has protected Jewish people during the long golus has been the study of Torah and the practice of mitzvos; hence, Torah observant Jews should not make the inviolability of Eretz Yisroel as the overriding I countered that they missed the point, for my position has nothing to do with Eretz Yisroel as such, but with the pikuach nefesh of the Jews living there – which would apply to any part of the world. I have not “yet” received an answer to this point, either. I was similarly criticized for accusing the government of Eretz Yisroel of reluctance to find and apprehend the murderous attack in Hebron on that Friday night. I do not know what this has to do with the issue of returning liberated areas! At any rate, the facts are as follows. Before coming out to charge the government publicly with not trying to apprehend the murderers, I tried to do what I could behind the scenes. It is known that there were two schools of thought in the government on this issue. One held that it would be expedient not to press the hunt for the killers on the ground that to find and put them on trial, etc. would exacerbate tensions; therefore it would be better to put the matter at rest by procrastination. The other held, that the government should take all possible action to apprehend the killers and punish them swiftly, not only because “the blood of our brethren cries out to us from the earth,” but also, and just as importantly, for pikuach nefesh reasons, to prevent further similar attacks. For, anyone who knows the mentality of those Arab circles from which the terrorists came, knows that failure to punish them would be interpreted as a sign of weakness and be an encouragement to repeat such attacks. This debate went on for weeks. When I saw that inaction was the government’s policy and that it would be a serious blow to pikuach nefesh, I made my public statement. Fortunately it had an impact and finally the hint began I earnest, resulting in the speedy apprehension of the leader of the gang. Parenthetically, the sad epilogue of this chapter, which is in itself a reflection of the state of affairs in Eretz Yisroel, is that although many weeks have passed since the murderer was caught, he has not as yet been put on trial and there is still no word as to when this will come to pass. No further commentaries are necessary. It should be noted, however, that the policy of playing down terrorist attacks and avoiding counter-action wherever possible is, unfortunately one that goes back many years, evidently for the reasons indicated above, as is also borne out by the enclosed newspaper clipping. A further criticism leveled against me is that my pronouncements on the issues are more political than Rabbinic. This, too, baffles me, for inasmuch as the matter has to do with pikuach nefesh, it is surely the duty of every Jew, be he Rabbi or layman, to do all permitted by the Shulchan Aruch to help forestall or, at any rate, minimize, the danger. In a case of pikuach nefesh, every possible effort must be made, even if there is a sofek/doubt and many doubts whether the effort will succeed. As for the matter regarding the reception given to the person involved in this controversy on his arrival in New York, as if I, or my emissaries, instigated the demonstration against him, etc. Needless to say that this charge is totally not true. Even in an oral discussion I am careful not to identify by name anyone who takes an opposite view and limit myself to issues and not personalities. Especially when the person is known to me personally and I have high regard for him, and from my side, still regard as a friend. In conclusion, I must also say that in general I find myself in an uncomfortable position in any situation where I find it necessary to disagree with an orthodox Rabbi publicly in such a matter of halachah. For when a layman sees that there are Rabbis who, having been misled by misinformation, yet they still don't retract their ruling even after the correct information has been brought to light, so this affects ones confidence in the credibility of all Rabbinic authority. Especially this, obviously, runs counter to the basic policy and work of Lubavitch in disseminating Torah –true Yiddishkeit, with emphasis on the honor of the Torah and the honor of the true bearers of the Torah – the Rabbis who dedicate all their life to the study of Torah and who live accordingly and exemplify Torah-true Yiddishkeit in the fullest measure. The following has been delayed as I was waiting for the enclosed newspaper clippings before replying to the criticism against the group of Rabbis who are alleged to have brought the controversy into the limelight of the English press. Actually, the complaint should have been addressed to the group of Rabbis and, in any case, it has no relevance to my stand. However, in view of the general confusion regarding these issues, as already noted above, I will clarify this point also. The fact is that the subject matter had at first been publicized in the same English press, giving expression to the opposite view and, in a much sharper form, by a group of prominent Jews, as can be seen from the enclosed clippings, as early as June 15 and there was also a sequel to it. The declaration by the group of Rabbis (which received less generous coverage), appeared on or around the 2nd of July. I do not have this particular clipping at hand, but no doubt critics have it and can verify it. One point which I hesitated embodying in my letter, but decided to add in the p.s., is this. Rabbis who, differing from my view, declared their Torah and halachah view on the question of returning liberated areas in Eretz Yisroel, also based it on the principle of pikuach nefesh, but in reverse to mine. Their opinion is based on the belief that returning liberated areas would advance the cause of peace with the Arabs and this save lives. If this opinion is valid, it inexorably follows from it that the thrust of the argument as it is applied to the Golan, Yehudah and Shomron (West Bank) applies also to the Old City of Jerusalem and in fact more forcefully, since the clamor for the return of Old Jerusalem is more genuinely unanimous and stronger by all the Arabs, including Egypt, Saudi Arabia and the whole Islamic world (while not all of them are so “enthusiastic” about creating a new and independent Palestinian State on the West Bank). For the said Rabbis to be consistent halachically, the return of Old Jerusalem is not only permissible but imperative! Hence, in all conscience, they are duty-bound to incorporate in their psak din the return of the Old City of Jerusalem! The above letter is from the soon-to-be-published Volume III of The Letter and the Spirit by Nissan Mindel Publications. The letters are from the archives of Rabbi Dr. Nissan Mindel, a personal secretary to the Previous Rebbe and The Rebbe, whose responsibilities included the Rebbe’s correspondence in English. We thank Rabbi Sholom Ber Shapiro, director of Nissan Mindel Publications and the one entrusted by Rabbi Mindel, his father-in-law, with his archives, for making these letters available to the wider public. May the merit of the many stand him in good stead.